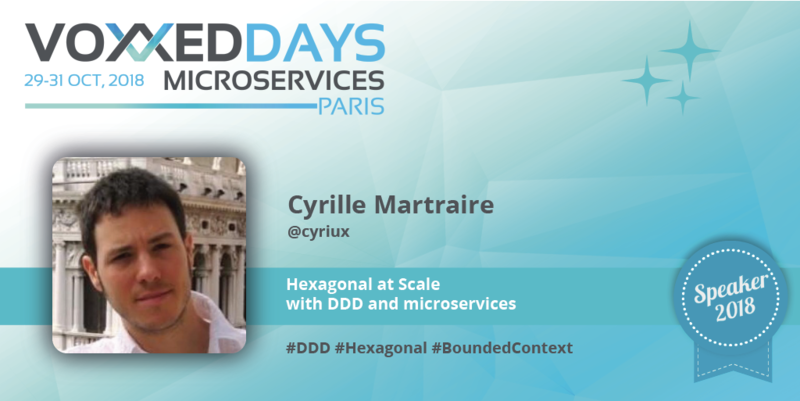 Hi Cyrille, tell us who you are and what lead you into microservices? Hi, I’m an happy developer! I’m lucky to have great colleagues at Arolla and around who care about how to do things well in software. Which means I’m enthusiastic about design in every aspect, from OO to FP, from TDD, which is about design indeed, to architecture, plus Domain-Driven Design of course! I’ve fallen into microservices because of my expertise in DDD: customers naturally asked me to help in their microservices initiatives, especially on how to split legacy monoliths or large legacy systems into microservices. I’ll be talking about DDD for microservices, surprisingly, because Microservices need DDD absolutely! So I’ll talk about Bounded Contexts and what this means in practice in your code, because it’s sometime disturbing for some developers. And I’ll also mention a recent discovery we’ve made with my colleague Arnauld Loyer, that the good old Hexagonal Architecture that we know as a way to implement the inside of an application also stretches to a galaxy of microservices. But I don’t want to spoil it! When talking about DDD everybody assumes that it is the only way to model microservices ? Is there other techniques you would recommend to be able to bind a service to its business context ? It’s true that the DDD mindset is central to define the boundaries of most microservices. But even as a DDD fanboy I have to make it clear that some services have to follow a different kind of logic than a business domain logic. For example purely technical services, legacy services, and most front-end services. It takes some serious thinking, or many experiments that will fail, to get a system of microservices right! Yes, I’m happy that Voxxed also embraces microservices, and in our beautiful city of Paris!